Title: Snow at Nihonbashi on New Year’s Morning. The Nihonbashi (Japan Bridge), was at the heart of Edo and the starting point of the ichirizuka, the mileposts highway that linked Kyoto with Edo. The view is to the east, towards an early sunrise after a light sprinkling of snow and a misty sky. Despite many prints looking to the west from this viewpoint to see Mt Fuji, Eisen takes this easterly view so Mt Fuji cannot be seen. The bridge is full of people going about their morning duties preparing for the New Year’s festivities. Workers push a cart over the bridge to the right, two women stand on the bridge looking at the first sunrise of the year. Fish Mongers go about their morning work, selling and delivering a catch of “first bonito”, a highly prized delicacy in the Edo period. 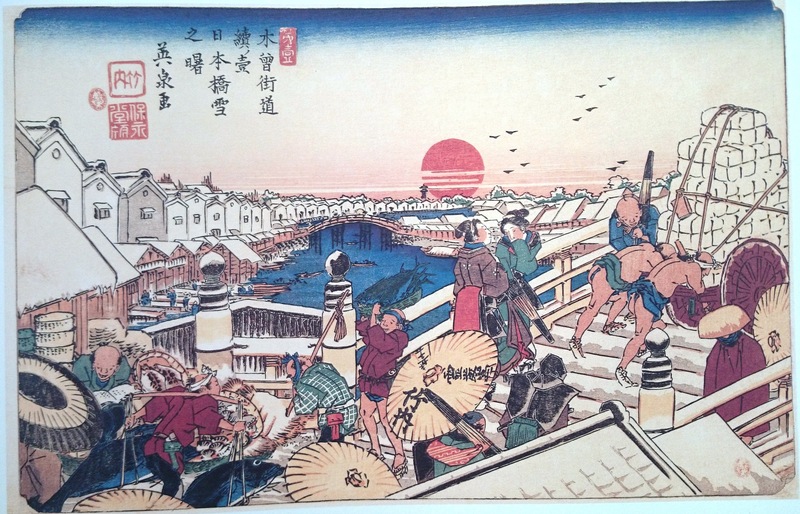 We can also see a monk, a hooded samurai and other merchants and pedestrians using the bridge. Beyond the bridge, there is a row of merchant warehouses that line the side of the canal, evidence of the commercial activity of old Edo. The parasol in the center of the print contains Eisen’s signature, the publisher’s mark as well as “sheep” evidence of the Year of the Sheep (1835), when the print was made. Stay tuned for more prints. Previous Post Ashikaga Yoshiteru – 13th Ashikaga Shogun. Next Post Keisai Eisen – 69 Stations of the Kisokaido – Plate 8.